THIS was my first Stephen King novel. I’ve seen films made from his books but never read a novel. My shame knows no boundaries. Forgive me. 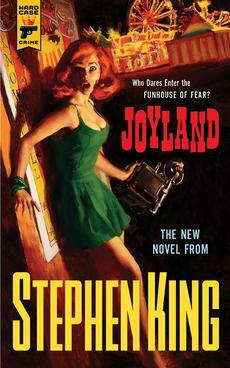 Joyland reads so easily, took me two days and was a breeze to get through. The writing is easy, dialogue straight forward and the carney setting is really interesting. The story revolves around a 20 year old on holiday who gets a job at Joyland, a fun fair. There is a ghost in the Horror House and a murderer on the loose. That is the most compact synopsis without giving away too much. Ultimately I liked this but was left feeling a little short changed, it just didn’t feel like it had any depth. No doubt this isn’t one of the best novels of Stephen King’s to start with. It was touted as pulp fiction which I got excited about. In essence yeah it is, but it isn’t the gritty pulp fiction I know and like, it is the pulp fiction that really tells a story and not much else. On one paw I enjoyed reading this because it made me feel like a speed reader and the story is intriguing enough, and the setting interesting enough to warrant reading on. On the other paw this seemed like a lazy effort aimed at teenagers. The dialogue was basic and really there wasn’t anything that made this exceptional or even better than average. If you want a solid throwaway read check it out, otherwise I think you might be disappointed. I do admire the fact that this was deliberately printed in book form and not digitalised, in an effort to help publishing and book stores out I’d imagine.